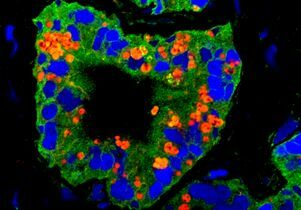 In this microscopic image of a prostate tumor, cancer cells (nuclei in blue) are seen expressing different stem cell traits (in green and red). The yellow areas indicate where the two stem cell traits are expressed together. 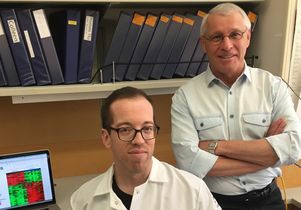 Bryan Smith (left), postdoctoral researcher, and Owen Witte, director of the Eli and Edythe Broad Center of Regenerative Medicine and Stem Cell Research at UCLA. 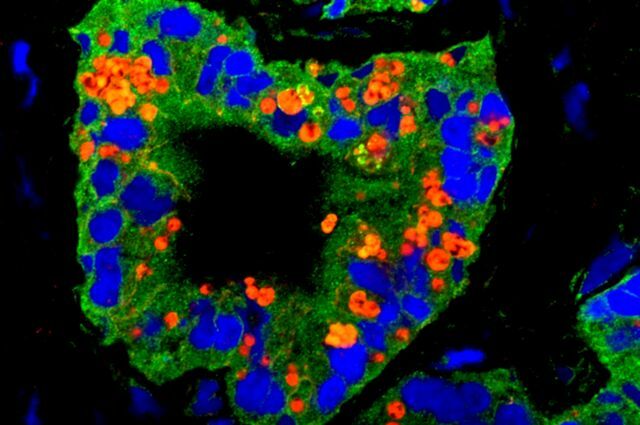 Cells of a prostate cancer tumor. Bryan Smith and Owen Witte.